A firm hoping to build a £150m private railway in Windsor says it will have raised the £10m needed for planning permission by the end of 2014. Windsor Link Railway (WLR) wants to build a tunnel between Windsor & Eton station to Windsor & Eton Riverside station but permission alone is expected to cost between £3m and £10m. The link would allow through trains from Slough down to the Waterloo line. Network Rail approved plans for the scheme in 2013. WLR managing director George Bathurst said if the transport and works application, which includes planning permission, was uncontested it would cost in the region of £3m, but if alterations were required it could cost up to £10m. Mr Bathurst, who is also a Windsor and Maidenhead borough councillor, said: "We are hopefully bringing more private money into the rail network with no cost to the taxpayer so hopefully everybody will be a winner." WLR said the track, when complete, would be the "first wholly privately promoted and funded railway project for over 100 years". 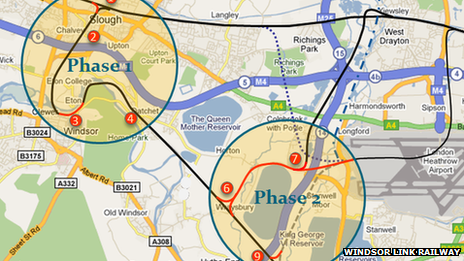 It said future phases were also planned, including direct connections to Heathrow from Ascot.